Everyday Gift Wrap consist of stripes, polka dots, leaves, and more. With hundred of patterns available it's easy to find exactly what you need. Use everyday patterns for birthdays, Easter, anniversaries, baby showers, bridal showers and more. Many sizes available, full ream, ½ ream, cutter box and jeweler's rolls. 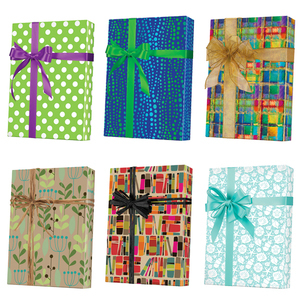 You will find giftwrap from Jillson Roberts, Shamrock and Sullivan.